Applications: The Lockit quick change system is interchangeable with an alternative product called 'Roloc'. Ideal for working on small areas, such as in automotive repair and aerospace. Discs are available across the entire range of products from 24 grit through to felt for mirror polishing. Product Notes: Lockit supports have threaded holes to accept the studs fitted to matching discs. For most work, especially on car body, coachwork and working on curved surfaces, we recommend flexible (F) backing pads We also offer medium (M) hardness backing pads, which are ideal for a wide range of uses from coarse stock removal to fine finishing on flat areas. Use lighter pressure for finer work. The rubber supports are heat resistant and suited to long periods of operation. 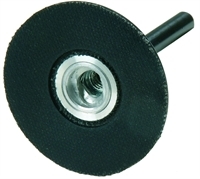 Available with 6mm (listed as '6') spindle mounting for flexible tools etc and M14 female thread to fit 115mm (41/2") and 125mm (5") grinders and polishers. Also Available: We stock full range of compatible sanding, surface conditioning, stripping, felt polishing and unitised quick change discs.